Oscillators – An Oscillator basically consists of an amplifier and a phase shifting network. The amplifier receives the output of phase shifting network, amplifies it, phase shifts it through 1800 and applies it to the input of network. The network phase shifts the amplifier output through another 1800 and attenuates it before applying it back to amplifier input. Oscillators will not be sustained if, at the oscillator frequency, the magnitude of the product of the transfer gain of the amplifier and the magnitude of the FB factor of the FBN (the magnitude of the loop gain) are less than unity. 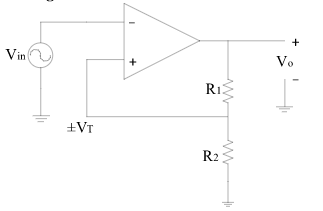 The condition of unity loop gain  A = 1 is called the Barkhausen criterion. Here A= 1 and that phase of  A is zero. 2. Useful for frequencies in the audio range. 3. A sine wave output can be obtained.